This shouldn't be labeled as "free"
It doesn't open up at all. So frustrated!!!! Don't update until they fix this, unless you don't care about your previous issues. App opens for a second and then closes. Will try to re-install. 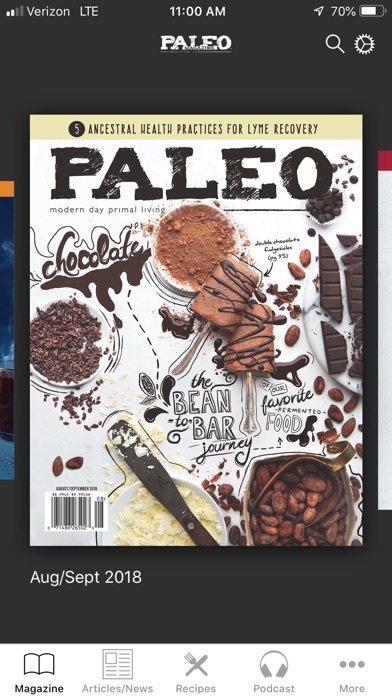 Paleo Magazine is one of the few magazines I purchase and read cover to cover. Having it on my iPad simply makes it that much easier to take with me to work, the doctor's office, or to a quiet place to read. The subscription rate is extremely fair for an electronic magazine. I know that most people bawk at having to pay for magazine, but magazines cost money to produce and having them in electronic format helps with a few enviromental issues. All in all, whether you live the Paleo lifestyle or are considering it, this should be a part of your app library. When people ask you about your Paleo life you can now respond, "There's an app for that." Love the magazine and really would like to read it on my iPad. But am not willing to pay for both a print version(which my wife enjoys) and an electronic version for me. P Ease follow many other magazines example and support your print subscribers. Thanks and keep publishing a great magazine. Great mag!!!! Having it in e-zine form is a huge bonus for me! Keep up the good work! It's like a roundup of all the excellent Paleo sources, material, and coverage all in one package. At the time of this review the magazine doesn't place itself in Newstand sadly. Very recommended for anyone on a Paleo reading binge! The magazine is absolutely beautiful! Great info and content with vivid pictures. A must-have for anyone following a Paleo lifestyle! Very happy there is finally an app like this! So the other complaints maybe valid but the description of the app is accurate. I am relatively new to the Paleo lifestyle but I love it and I LOVE the magazine such great information! Paleo has saved my life and I love the sense of community this magazine has with great articles and recipes! So thank you. My only suggestion is for people considering this subscription, it would be nice to be able to download one magazine for free it is great but it took me much longer to push myself to spend the money. Enjoy the articles and the recipes. Best paleo magazine out there! Super easy to get to all your issues. Gotta love it when something is represented as "free" but it costs money to activate. When the publishers of this notsofree app get honest, maybe I'll be back. Latest updates fixed crashes. Content is great. The magazine is not really free to read. Once you download it to your Newstand...it then requires you to pay $2.99 per issue. Deceiving!!! This magazine provides so much it is hard to capture it all. 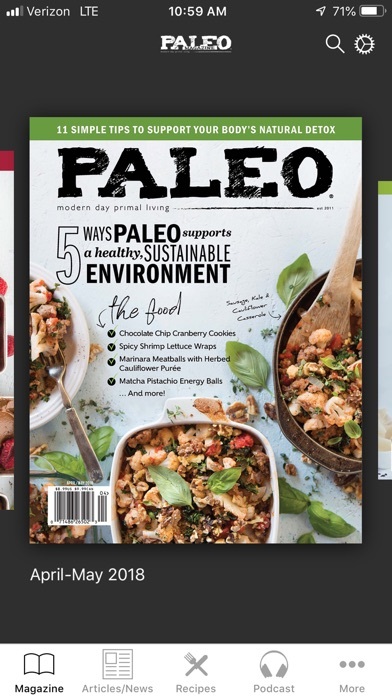 Whether you are new to a Paleo life-style or have been living it for some time this magazine can provide guidance and support like nothing else on the market. You can find everything from how to get started to how to live out your best life for the rest of your. You can find many delicious recipes and help with meal planning and shopping. You can find advice on including more movement into your life and how to enjoy the outdoors more. You can find referrals to study more about the Paleo life-style and you get to see advertisements from lots of good Paleo resources. Guess you can tell I like this magazine a lot. Well, downloaded it, have attempted to buy the magazine at least 100 times today. It will not work. Sent message to support and of course they cannot figure out whats going on. Epic fail on this. Don't get it, it's just not worth the hassle! I am a cross fitter and so paleo is a way of life and so much good info in this magazine.... Enjoy!!! Free apps can have in app purchases and most magazine apps do. This app deserves 4-5 stars.... The app is great! I love the articles and resources. If you follow the paleo diet then check this app out! I like the content of the magazine, but there is a really annoying ad screen that continues to rise up from the bottom of the screen when I am reading, even if I'm not touching that part of the screen when turning pages. It's SUPER ANNOYING - to the pointed that I'm tempted to ask for a refund on my subscription. 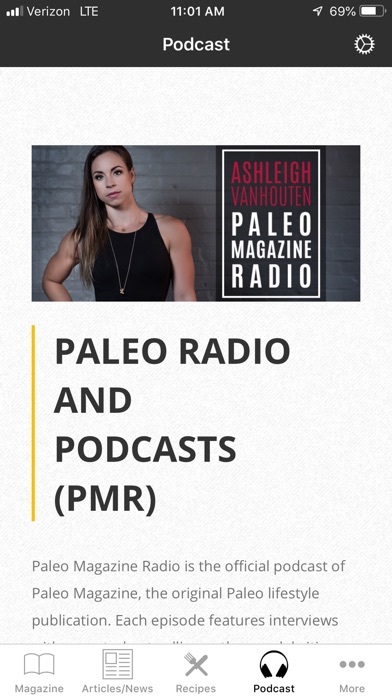 Full disclosure, I'm a writer for Paleo magazine and host of their podcast, Paleo Magazine Radio. 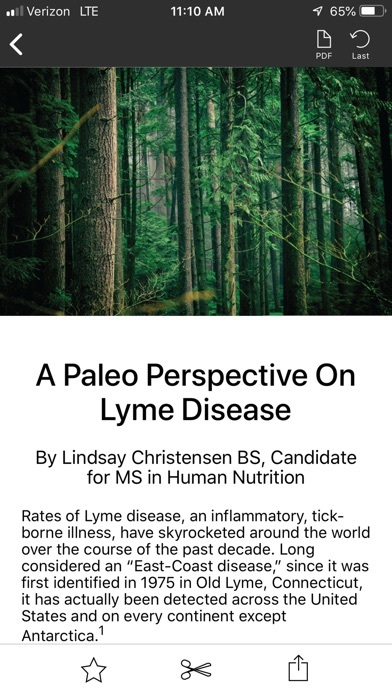 I love this app since so many people have asked me where they can buy Paleo magazine and, unfortunately, it is still unavailable in print form at many stores. 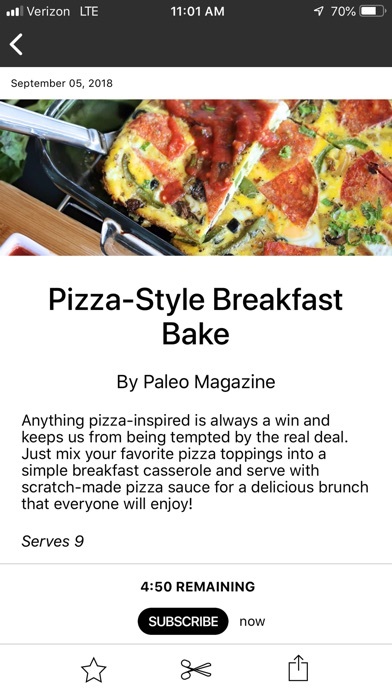 Having access to Paleo Magazine content right on your iPhone or iPad eliminates this problem and puts all the great paleo diet, fitness and lifestyle information Paleo Magazine is known for right at your fingertips! I guess I'm either incompetent or don't understand. I paid the $14.99 a while back for what I believed to be an annual subscription. I'm lost because when I attempt to download a current or past issue, I have to pay an additional $2.99 an issue. I thought paying $14.99 paid for 6 issues/1 year? Yes, I'm logged into the app when attempting a download. I also thought that my entering my password to download a single issue I would see a message that bypassed the $2.99 fee, but nope. I did contact support a while back but didn't get an answer I understood. It still cost $2.99 a download. I do like the mag, love the writers, contributors and have no issues with the content, I just wish things were explained better. I also wish I understood the confusion and what the $14.99 fee I paid was for. A gateway perhaps? I have a couple subscriptions via Zinio as well and it works as advertised and is idiot proof. Downloading a magazine and paying for a subscription shouldn't be this complicated. Zinio even sends an email when a new subscribed issue hits the store, click, download, done. This app must have slid by the folks that approve the apps before hitting the App Store. Purchased this with a hopeful outlook. Then I read material which was subpar & could be found on any blog via a quick google search for free. While i appreciate you being only paleo mag in store this is NOT worth the money at all. I have not been able to open the magazine after paying a one year subscription. I'm ready to get my money back. I can’t see the articles correctly. I can’t see the articles correctly through my iPhone and iPad mini. It's a magazine. Of course it costs money to subscribe. If I wanted the information that's available for free, I'd surf the web. I have not had the crashing that the early adopters seemed to experience. The app appears to work smoothly at presenting the material. As for the content, the recipes are great! Always filled with great product & health info & amazing recipes! I’ve found articles in this mag more informative than other media. Example being a topic on 5G wireless & what to know about it for your health’s sake!! Love it! Have IPhone 4 App would not open!! When I try to open the app it shows a loading screen then after 5 or so seconds it takes me out of the app. Deleted and reinstalled but the problem remains. The only function of this app is to sell subscriptions, so although the app is free it is unusable without cash outlay, even to existing Paleo Magazine subscribers. Two thumbs down! Where did my 2012 Paleo Magazines go???? Not even a sample of a recipe. This app only leads to issues which you must pay for. Deleted immediately. Don't waste your time! I already subscribe to the paper version of this, and there is no way to tie that subscription to the electronic version. Just about every other magazine I subscribe to offers this. Great magazine! I was buying it in hard copy form and was excited to add it to my newsstand. Some of my favorite Paleo recipe have been found here (#1 is spicy pineapple chili). I purchased a couple of copies to see if I wanted to subscribe; I had just barely begun reading them when they updated the system. Now my purchased copies can't be downloaded & read. Supports only help is to walk me through the "restore purchases" that I'd done perfectly. Now what? The programming is clearly broken as you can neither purchase nor restore. Their flummoxed & I'm just another failed customer whom in this economy is better off spending my money to support organic & grass-fed, and getting my paleo support for free online. It's just sad because clearly some of us dearly, & passionately wanted to support this venture. UPDATE: They claim to have located my purchased Copies in their system & to have a solution. I will fairly update this review to include more stars if they've a true solution. Ok, I'll be nice. This app is not what it seems. You don't actually get the magazine unless you pay. I was fooled. I'll be deleting this app as soon as I'm done writing this review. Don't waste your tome. Shame on you guys.